See What Big Government Costs in New Mexico! The purpose of this paper is to understand and estimate the cost of big government in New Mexico. We have a grand opportunity to make New Mexico prosperous, and we are not taking advantage of it. Perhaps the cost estimates contained herein will aid in changing our mindset. As has been well documented, New Mexico has one of the worst economic climates in the nation. Over the long haul we have tried to make ourselves prosperous by increasing government programs. As a result we are overly taxed and regulated. Government programs and high taxes and regulations have actually reduced our prosperity. If claims about all the magic of economic multipliers from more government were true, we would be one of the most prosperous states in the nation. But these claims are not true. Messenheimer (2000) provides statistical evidence of the relationship between smaller, less intrusive governments and greater prosperity across the states. Professor Richard Vedder (2002) and the Karabegovic, et.al. (2002) independently confirm the same statistical relationship, including comparable economic benefits of smaller, less intrusive government. Why is our state government not getting the picture? Assuming that we really would like to have a prosperous state, recent initiatives to increase government are counterproductive. They are the result of what economists call “concentrated benefits and widely dispersed costs.” Those who receive the concentrated benefits are clearly defined, and they are grateful when politicians show up for ribbon cutting ceremonies and take credit. But those who pay in terms of lost jobs and wages are unseen and unheard, since the effects on them are individually imperceptible. We now can think about the costs borne by the unseen and unheard due to spending and economic development initiatives. By looking at their effects on our economy in terms of tax reductions forgone, we can see what might have been for the unseen and unheard. It is important to understand that additional spending, subsidies or tax credits all have the same effect. In each case the fisc uses revenue that could have been given up for overall tax reduction. In that spirit, we have developed a simple calculator that shows the costs of more spending or economic development initiatives in terms of lost jobs, wages, total earned income and revenue received by local tax jurisdictions. Using estimates from our tax reduction model (see Messenheimer, 2002 for a complete explanation of the model) our calculator that shows the effects of more spending, subsidies or tax credits in terms of their alternative: the tax reductions forgone. Now you can see what we mean when we say the victims of increased spending are without a voice. 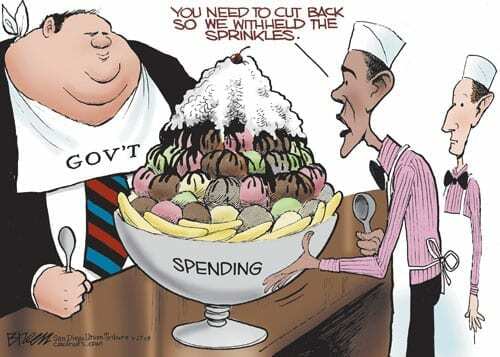 They don’t realize they are getting ripped off little-by-little as spending increases. “Bring in some movies,” they say in Santa Fe, “it will only cost us $10 million to help poor little unfortunate Shirley McLain and the other poor folks from Hollywood.” The loss spread among regular people in terms of the alternative of $10 million in tax reduction is imperceptible to them. Who can tell where the 2120 jobs went? They are impossible to trace. Similarly, what worker will understand that on average they could be making another $150 per year? The table below displays the unseen and unheard costs of more government in increments of $10 million.